We love fall recipes. They are so warming and bring a lot of comfort on dark days! The smell fall baking and cooking brings is half of the warmth, don't you agree? I love to use my oven in the fall and winter! 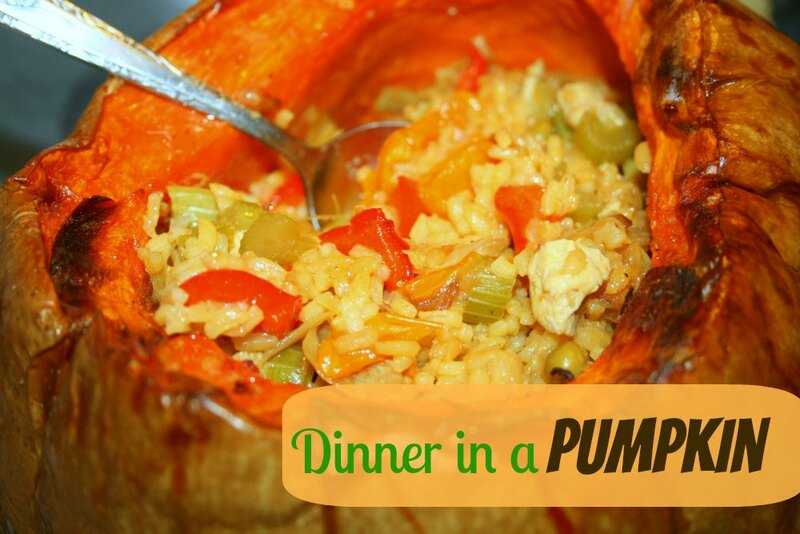 I hope you enjoy this fall recipe for dinner in a pumpkin. It is one of my favorite fall and winter pumpkin recipes. This is a really easy recipe. The best thing for you to know is that you can take most rice or potato dishes and add it to a cooked pumpkin and make this dish. 2. Remove top of pumpkin and set aside; hollow out, discarding everything but the pulp. 3. Decorate with permanent markers, if desired. You could write the name of the dish, draw a pumpkin face, etc. 4. Take 1 tablespoon of oil and lightly oil the inside of the pumpkin. 5. Sprinkle around the salt, pepper and garlic powder. 6. Put the pumpkin and top in a baking dish and then on a baking sheet and cook for 1 hour in the oven. While pumpkin is baking put together the rice mixture. 1. With 1 tablespoon of oil, saute onion, celery and garlic for 5 minutes. 3. Add in tomatoes, soy sauce, sugar, water chestnuts and seasoning to taste. 4. Once combined, let simmer for 5 minutes and add in cooked rice. 5. Turn off heat. Add mixture to pumpkin that has cooked for 1 hour. 6. Add the top to the pumpkin and put back in oven. Cook for 1 more hour. 7. Cooking time varies by size of pumpkin but a 10-12 inch pumpkin should only take 2 hours total to cook. After the 2nd hour, the pumpkin should be soft to touch. Don't overcook or the pumpkin may collapse. 8. To serve put it on a fun platter. Scoop out the food on a plate making sure you are getting pumpkin with the rice mixture. You can also slice the pumpkin and include rice on top of each slice. 9. Serves 6-8. It is so tasty and a great way to get pumpkin in the diet. 10. This dish provided a lot of liquid. We used it to add on top of our food. *THIS can be made with any of your favorite rice or potato mixtures. I found it best to precook the pumpkin and the inside filling. This smelled so good cooking. I can't wait for it to get cooler out so that I can make it again. The vegetables that I used can also be substituted for any of your favorites. Check HERE for more Pumpkin, Fall & Halloween Recipes! Get new ones and add yours, too! 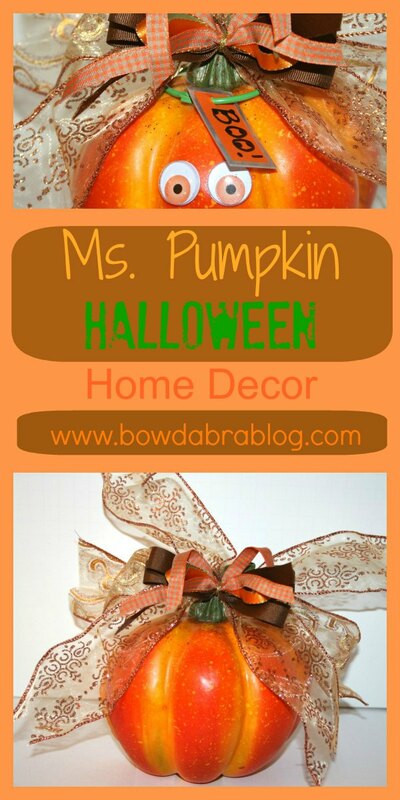 Need a fun pumpkin decoration? Check out my cute Ms. Pumpkin Home Decor that is being featured on Bowdabra. Thanks! 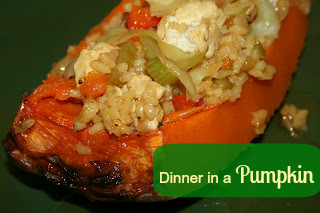 I love this recipe and I do have a meal I cook in a pumpkin....a pork stew that is so good! To me it says fall. End of the Month Coupons Print off! Coupons coupons and more printable coupons! Make your own chicken stock! Don't ever buy it!